Mahalaya Amavasya is the Aradhana day for Jagadguru Sri Chandrashekara Bharati Mahaswamiji, who adorned the Sringeri Sharada Peetham as its 34th Peethadhipati. Compiling here a few excerpts on this great Acharya and Jivanmukta. Some are from the book titled “Divine Discourses”, which contain a translation into English of the Kannada Bhashanams given by the 35th Acharya, Jagadguru Sri Abhinava Vidya Tirtha Mahaswamiji, about His Guru. 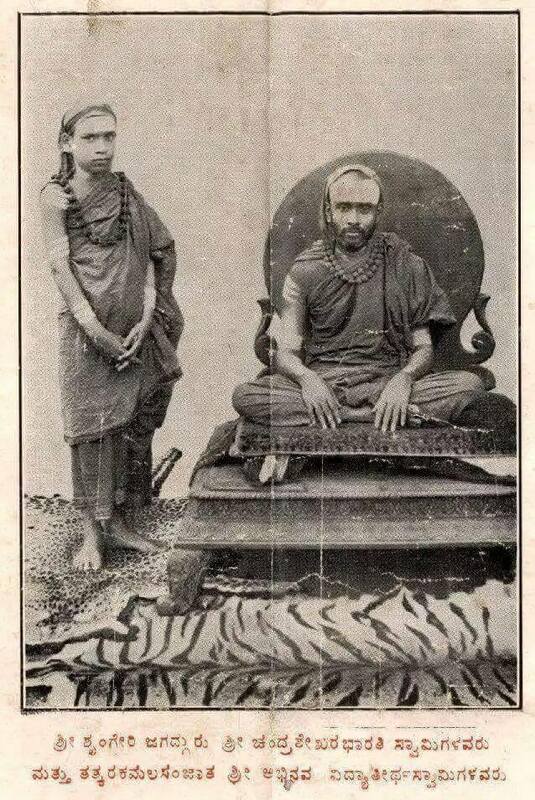 Another is from the book, “Jagadguru Sri Chandrashekara Bharati, Mystic and Seer”, which contains an account of the life of the Jagadguru. Excerpt 1: Acharya’s Teaching – An excerpt from “Divine Discourses”, in the (translated) words of the 35th Acharya. (After dissolving, by understanding, the five elements (earth, water, fire, air and Akasha) in an order which is the inverse of that of their origination, the sage remains calm, understanding the Atman, which is the residue). (Earth is to be dissolved in water, water in fire, fire in air, and this air in Akasha. Even this space has to be merged in the unmanifest cause of the five elements and the unmanifest must be merged in the pure Absolute. I am that pure Absolute, the Dissolver of all). (If even for an instant, a man thinks of his Atman as “I am Brahman”, that thought destroys his greatest paapa (mistake), just as sunrise dispels darkness). He advised Me, “Contemplate in the fashion indicated in the Atma Vidya Vilasam verse”. By his explanation, he created interest in it. When the Shaastra is taught, he said, one way is to explain a text line by line. Another is to expound the lines along with one’s own understanding and conviction. It was worth seeing this in his teacher; it gave great joy. Excerpt 2: Acharya’s love for His shishya (the 35th Jagadguru) – from “Divine Discourses”, in the words of the 35th Jagadguru. A characteristic of My Guru was that he recognised that no matter how we conduct ourselves, some right and wrong events will occur around us. I was then a boy and used to uninhibitedly express Myself. He used to advise Me, “You must not remark thus”. Yet the situation was such that it was difficult to ignore. Mantreshwara Sharma told my Guru, “Because of your compassion you have suffered a great deal. What about your disciple?” To this My Guru replied, “He is not like me. He is ever carefree and happy”. It was so. I used to climb trees and used to swim and enjoy Myself. My swimming, however, got him worried and if I was slow in coming out of the water in response to his call, he used to think, “Oh! What will happen?”. I have been in danger too. But at that age, it was not possible for Me to avoid swimming in an uninhibited manner even in rough waters; on seeing the river, I could not resist jumping in. Any repentance was only after a swim. Particularly, on noting the tight situations I had got into, My Guru used to say, “Do not go into the river”. Obediently, I used to respond, “Yes, Mahaswami; I shall do as you say”. Yet, on seeing water, I forgot all this. If asked, “Why did you swim?”, I, who did not know how to tell a lie, used to respond, “I did not do anything in the water that would have been the cause of fear”. “There is no need for either fear or a swim”, He used to say. Nowadays, I do not go for a swim and , in fact, when I see someone swimming uninhibitedly, I even remark, “Why are you unjustifiably going into the water?” When young, I was different. My Guru brought Me up with such great affection that He, who was established in the Atman, used to worry about any danger I might face in the river. When many difficulties occurred in the Math, I said, “Why stay in the Math at all?” He used to humorously reply, “It is Your fate that You have to stay”. When I responded, “But there is difficulty in doing so”, he said, “If You run away from problems, where is the role of discrimination (viveka)? By experiencing a tight situation, let the action of the past birth responsible for it yield fruit and exhaust itself. One is truly a man only if he accomplishes the task he has undertaken even though he may have to experience problems to achieve his end. If You run away from difficulties, it would not be praiseworthy”. One cannot but feel happy to hear the songs of the Jagadguru in his avadhoota state, in his room. There would be flow of songs seemingly unrelated, humorous and he would be clapping hands to tune. If only one paid attention and care to the songs it would be evident that they were all pregnant with wisdom and non-dualistic content. One recalls that at other times the Jagadguru would ordinarily send persons wishing to sing in his presence to Saradamba temple instead. This forced some into thinking that he did not have any interest in or knowledge of music. If only they had listened to the solitary songs of the Jagadguru, they would have been filled with disbelief at the divine music coming from his lips. At other times, due to the necessity of observing the rules of the Peetha and Sannyaasa Ashrama, he would not be able to sing freely to his heart’s content.